Whatever your interests may include I can guarantee that theres a “blind box” for it. These monthly subscriptions auto-deduct a set amount from your bank and send you a box of mystery products specified to your love for your dog (BarkBox), for health food (NatureBox), or even for the geek subculture (Nerd Block). 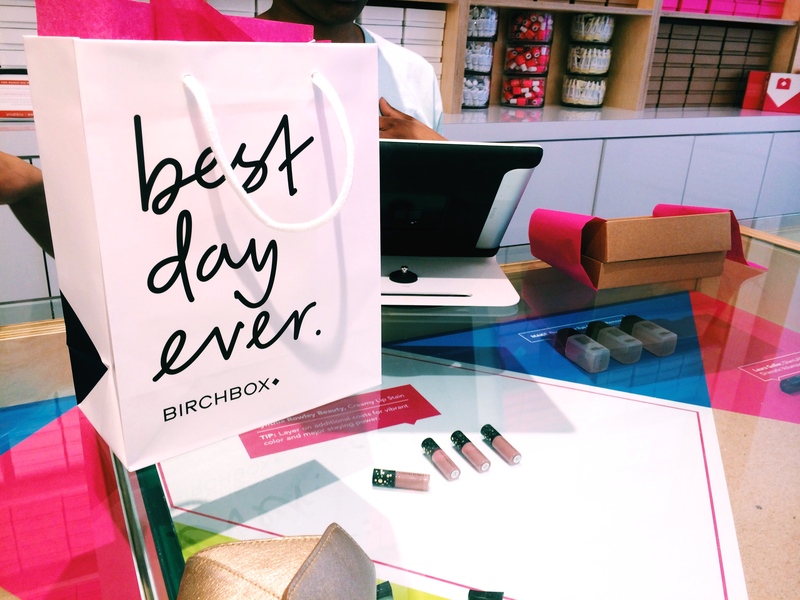 I had never considered joining a subscription or even bothered to look into the possibilities until I wandered into the Birchbox Flagship store in SoHo, NYC. The two-floor Flagship featured a seemingly endless variety of products and also a full service salon. I’m a sucker; I made my first box in-store and I was hooked. You know that amazing feeling you get when you ordered something online, but forgot about it by the time it was delivered to you? That “I love you, postman” sensation– thats essentially the joy of a blind box subscription. Monthly gifts… just ’cause. Here’s an introduction to two of my favorite subscriptions. Now that I’ve looked at some other options I can safely say that Birchbox is my favorite blind box subscription, and for only $10 a month its also one of the least expensive. If you love beauty products you know that it’s a little bit soul-crushing to spend $200 on a cream only to realize that it doesn’t work for you. Birchbox sends sample sizes of both cult classics and new products, all heavily reviewed first, so you can try an array of products without breaking the bank. Once you make an account you’ll fill out a questionnaire to ensure that every box is tailored to your preferences and body specifications. The box will always include 5 personalized beauty samples from categories such as hair, skincare, nails, makeup, fragrance, tools, and occasionally home & food. 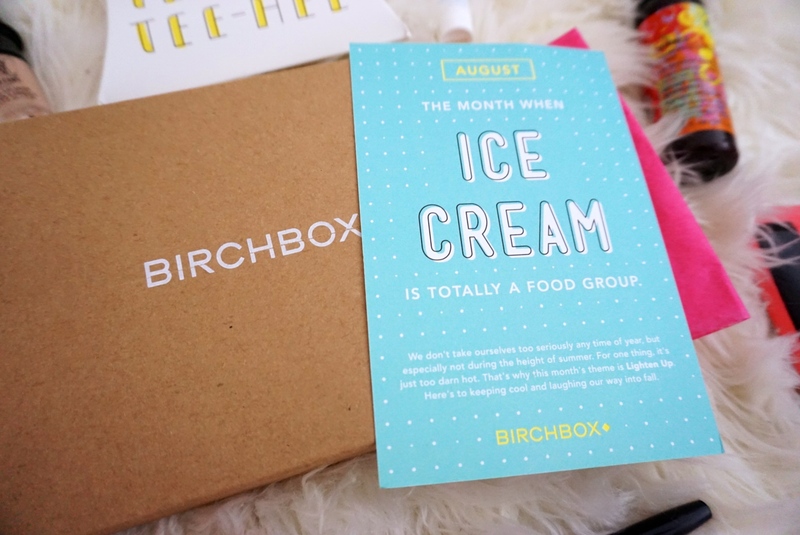 The Birchbox website offers all sampled products in full size for purchase (even the ones you may not have personally received), as well as a blog-style monthly “magazine.” Every dollar spent in the store earns you 1 Birch point, every month you receive a box earns you 10 points, and reviewing products also earns you 10 points. You can trade in these points for full size products. If you need proof of their good taste, the #1 bestselling product on their site is Oribe Dry Texturizing spray– my favorite hair product of all time. I love browsing the reviews for new products to try, and the samples are perfect for traveling. The “magazine” articles are aimed at technique, DIY, and beauty tips as opposed to pushing products on you. All in all its not a bad beauty blog to follow, even if you aren’t a member. The site layout is really clear, even offering an ingredient conscious section to save you from the big bad parabens, phthalates, sulfates, petrochemicals and GMOs. If beauty isn’t your main interest and you’re more into accessories and household trinkets, then maybe a Fancy Box would be more your speed. Fancy is an “online shop curated by the global community.” You see something cool… you can drop that link into Fancy and allow it to be browsed by the community. 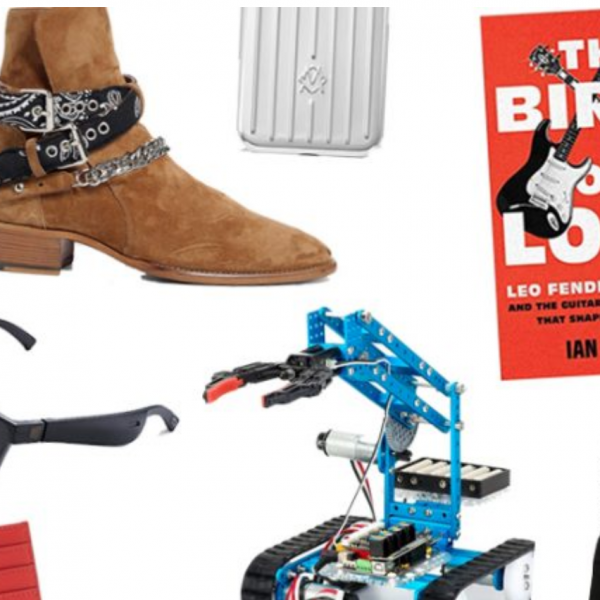 Pinterest meets eBay? They also have a series of blind boxes curated by various celebrities for a monthly fee of $39 and a supposed value of at least double that. Actress Jennifer Love Hewitt has a box, along with chef Tyler Florence, songstress Kelly Rowland, even rapper Snoop Dogg Snoop Lion. I chose the box by supermodel Coco Rocha on the grounds that it might include items most applicable to my interests i.e. 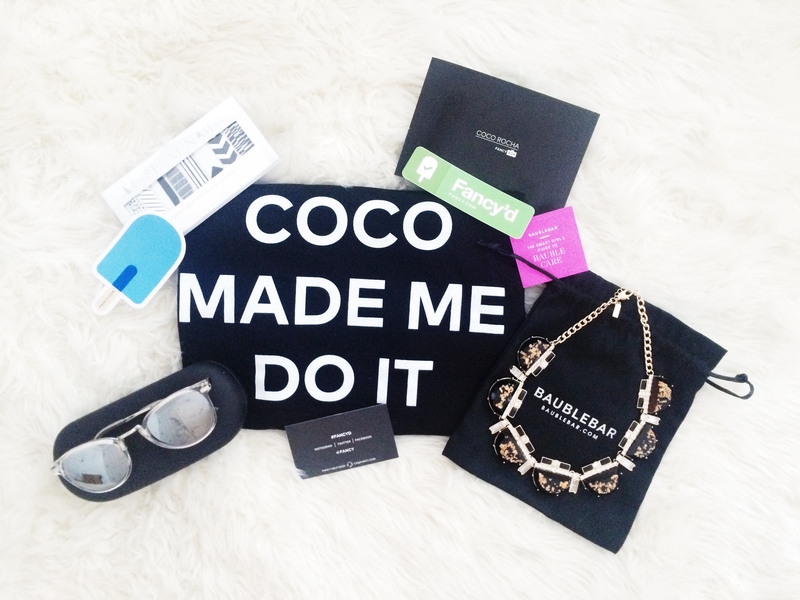 ; jewelry, accessories, dainty girly things (and I also just really like Coco Rocha). 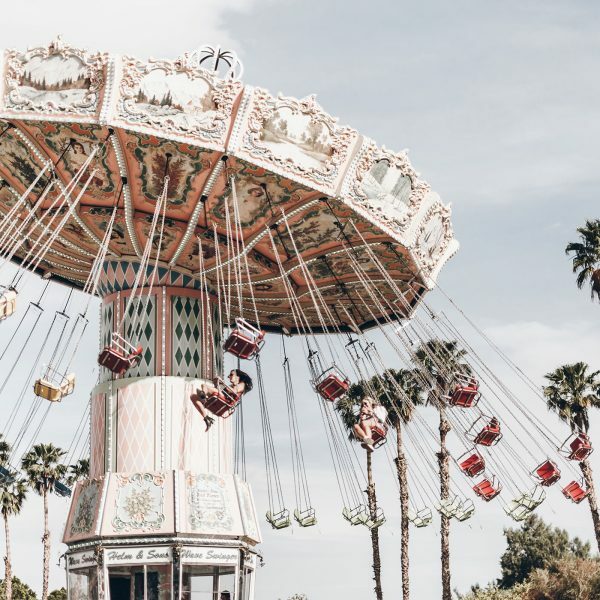 The most recent months have been themed for NYFW, Travel, Weddings, and Workouts. While the Workout box included headphones, a gym bag, a tank top she designed herself, and a few other trinkets my favorite so far has been the Travel box. Contents included an EVA-NYC hair care trail kit with quality necessities in TSA approved sizes, a universal travel adapter, a Phaidon Wallpaper NY City guide, electronic cleansing towelettes, and a passport style luggage tag. I couldn’t have imagined a better collection of items, and her descriptions and reasonings for each item were so thoughtful. While a Fancy Box subscription will cost you more than a Birchbox subscription, you will receive your moneys worth of products. Quay Sunglasses and Baublebar jewelry are some of Coco’s favorites to include. Are you a member of any blind box subscriptions? Whats the best item you’ve received so far? I hadn’t heard of Fancy Box but it looks pretty cool 🙂 I love getting little jewelry items and different things like that. I’m sure there’s boxes out there that have both jewelry and makeup products which would be cool. Great post! I’ve been researching a lot of subscription boxes lately but hadn’t heard of Fancy. Fancy seems like it might be a perfect mix. I wanted to get the PopSugar box.. but they don’t ship to Canada. Have you tried the FabFitFun box? I came across this post right after going through Lily Ghalichi’s Instagram (don’t ask me how I ended up there haha) and was interested in it. You’ve done a great roundup of both these boxes so if you’ve tried FabFitFun I wanted to get your opinion and see whether it’s worth the money or not! Definitely try spinning/ cycling classes. Great way to get fit and fun as well! I hadn’t heard of either of these before – definitely look forward to exploring these new options!